This cute summer DIY Watermelon wreath is super quick and easy to make and is so fun, colorful and festive for summer! 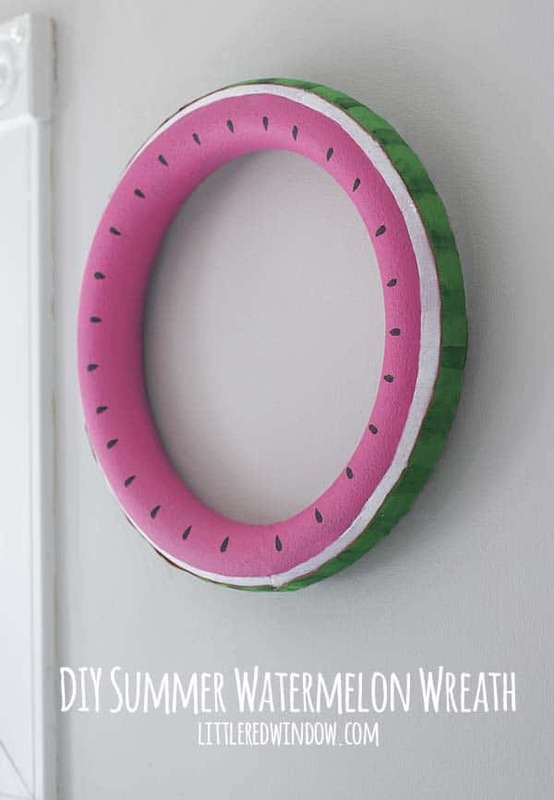 You guys, I recently accidentally cleaned out my office closet and this cute DIY watermelon wreath was the result! You might be thinking, “accidentally cleaned out your office? ?” Ok, I’ll be honest, I opened the door to get something out, and a bunch of stuff fell on my feet. It was like something out of a sitcom. I guess maybe I should be glad it was only the second shelf from the ground and not the one over my head? And it wasn’t even THAT messy. Seriously. But anyway, I reorganized, found this wreath form and felt like making a watermelon wreath. So I did! Here’s how I did it! 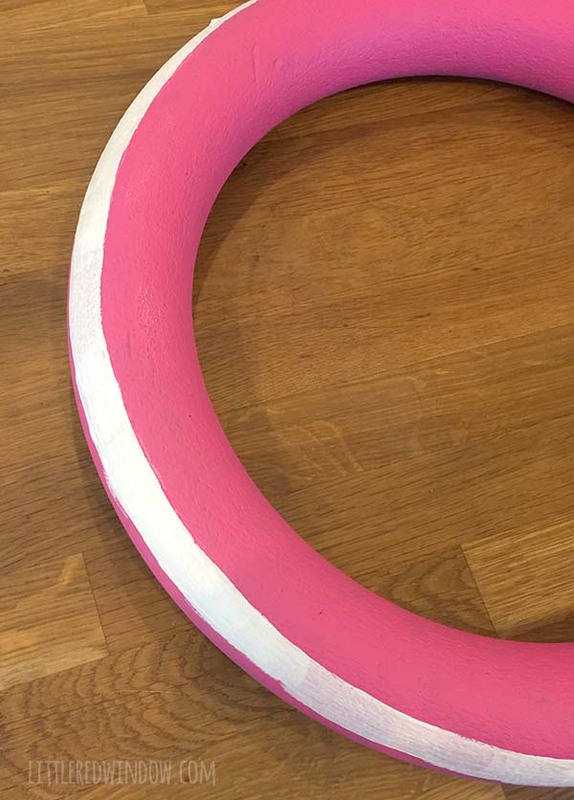 First I painted my wreath form mostly pink. (It was already painted silver from a previous project, ignore that!) And honestly, don’t think you’re being really smart and it would be much faster to spray paint it. The styrofoam will dissolve. Trust me on this one! Then add a white stripe around the edge. I just eyeballed it but you could draw a line first with pencil if you want. Next, slowly and carefully, hot glue the ribbon around the outer edge of the wreath. You may have to gently stretch and smooth it to get it to lay flat. I put a thin line of glue along both edges of the ribbon. 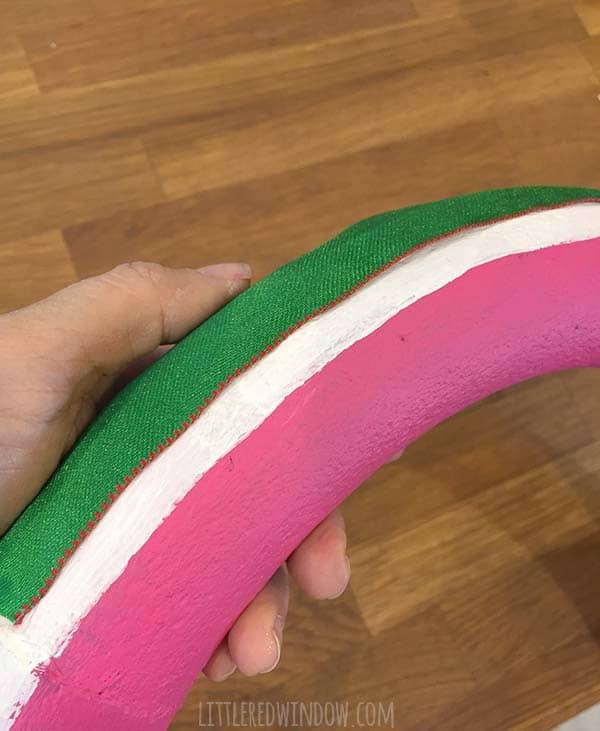 To add the watermelon stripes, I used a 3/4 wide brush and watered down green paint. 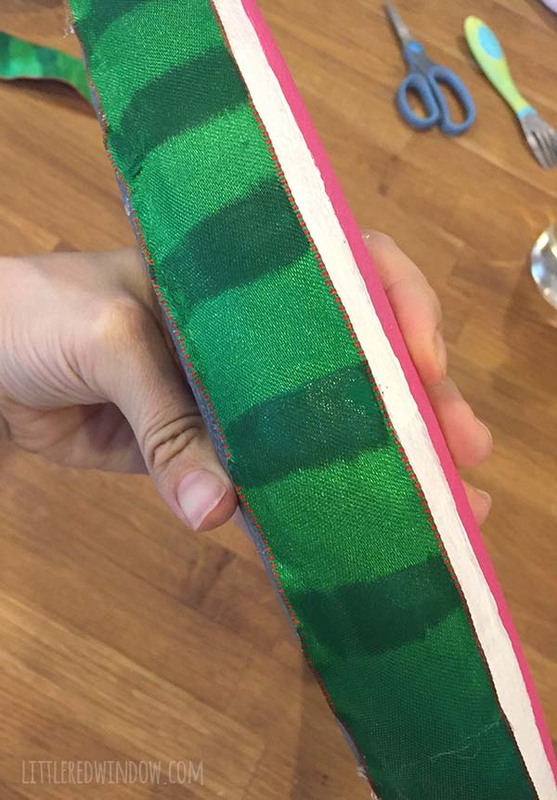 The water helped the paint bleed a little bit on the ribbon which makes it look more like the stripes on a real watermelon! 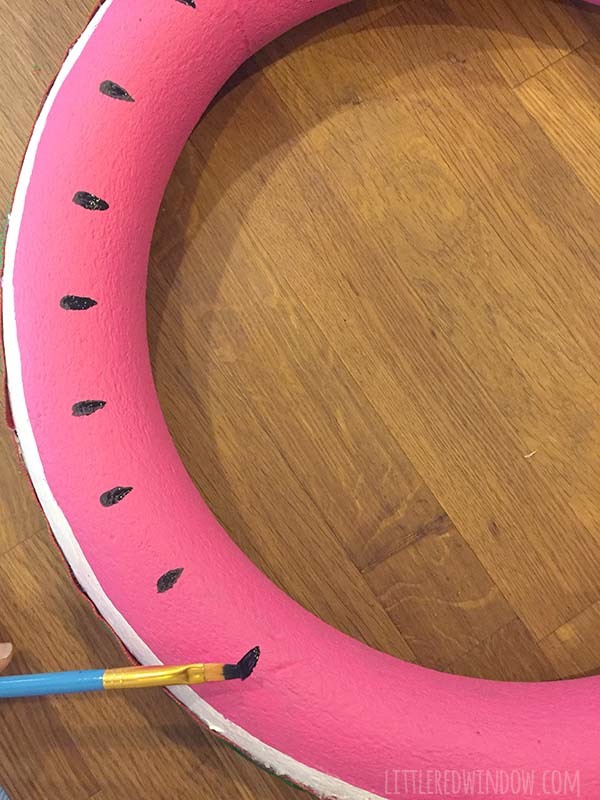 Finally use a small detail brush to paint the watermelon seeds with black paint. I also added a small loop of string to the back for hanging. 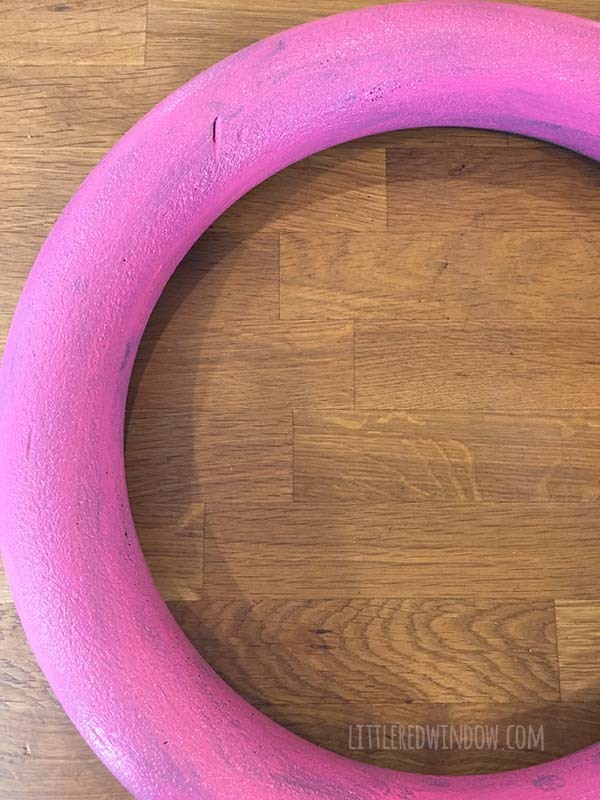 This wreath is super lightweight so that was enough! And that’s it! 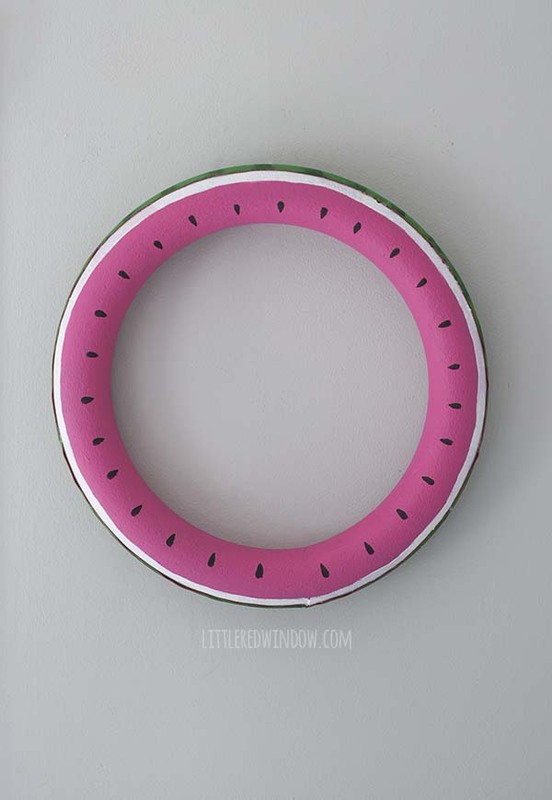 Enjoy your fun watermelon wreath!